Google announced today that they’ll be shipping a new version of the Nexus One smartphone that’s compatible with AT&T, firmly putting it up against the intra-network iPhone. Google, Apple: fight! Google’s Nexus One is a landmark in the history of Android phones. It’s the first to be branded as a Google phone, though it’s actually made by HTC; it’s the first to be sold directly to consumers from Google’s site, rather than through a retailer; and it’s the sexiest Android phone yet, the only one that can currently run the 2.1 firmware. It was privy to a substantial marketing push, especially online, buzz was huge, and reception has generally been positive–but apparently, none of that made much difference. The Nexus One has sold unexpectedly poorly since its release. Flurry checked into the numbers: at this point in the smartphone’s lifecycle, 74 days in, the iPhone had sold one million units. Motorola’s Droid, the other big Android handset out there and a groundbreaker in its own right, sold 1.05 million units. The Nexus One? A hundred thirty-five thousand. To call that anemic would be generous; to call it a flop might be premature, but Google certainly needs to make some sort of change, because that is a scarily low number. Why is it so poor? The most obvious reason is network. The Nexus One debuted, and until today remained exclusive to, T-Mobile, a reliable partner for Android but also the smallest major network. The Droid sold so well partly because it debuted on Verizon, the biggest carrier and one that had been itching for an iPhone competitor for years. T-Mobile has had every previous Android phone save the Droid and Hero, and a few exclusives of its own (G1, MyTouch 3G, Cliq), so a new Android handset may have seemed like a drop in the bucket. AT&T is the second-biggest carrier, and while it’s had more than its fair share of network problems, it also has the most in-demand phone on the market, the Apple iPhone. Now, the Nexus One is going right up against it–and while it should benefit from the larger customer base, the iPhone has the mindshare, marketshare, and desirability to pretty much make the Nexus One irrelevant. 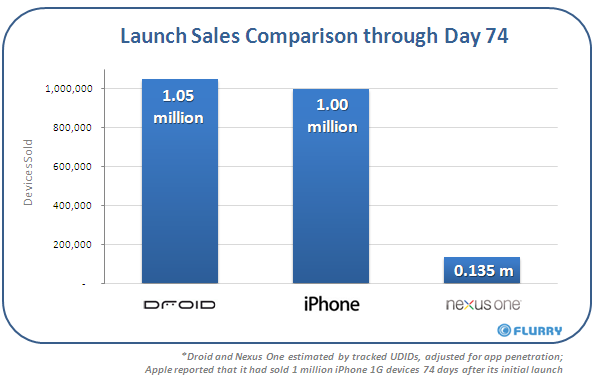 Luckily, the Nexus One will soon be launching on Verizon as well, where it compares favorably to the Droid. But by that time, we’ll be nearing the release of Microsoft‘s highly anticipated Windows Phone Series 7, Palm may whip out some new hardware for its fantastic-but-underselling WebOS platform, and the next-gen iPhone will be around the corner. In other words, despite being Google’s “superphone,” the Nexus One is having a terrible go of it. Currently, the Nexus One is only being sold unlocked for $530; presumably a subsidized plan is forthcoming.